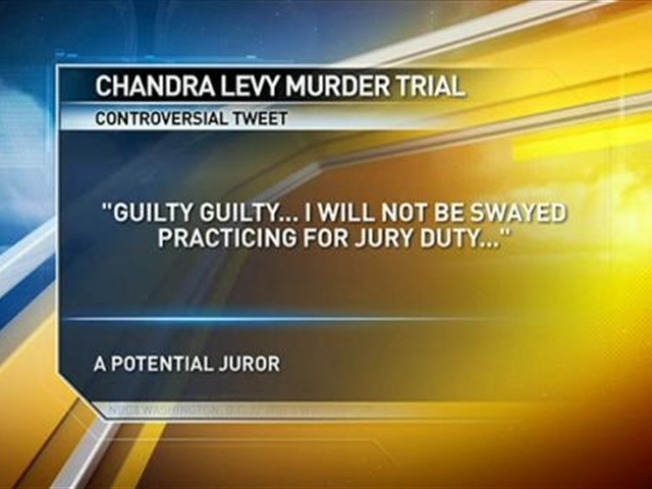 One potential juror in the Chandra Levy murder trial was dismissed after the defense complained about him tweeting Thursday night. Four men and 12 women -- 12 jurors and four alternates -- were selected for the jury, which was finalized Friday afternoon, News4's Pat Collins reported. In addition to instructing jurors not to try to investigate the case themselves and to decide based only on the evidence presented in court, the judge reminded them to avoid using social media to communicate about the trial. The tweeting potential juror explained to Collins that he'd merely tweeted out of habit. His tweet: "Guilty guilty... I will not be swayed. Practicing for jury duty." Ingmar Guandique is charged with the kidnapping and slaying of Levy in 2001. After her disappearance, it was revealed that she had been romantically linked to Rep. Gary Condit, D-Calif. For a time, Condit was a suspect, but police no longer believe he had anything to do with Levy's death. The defense had worried that pretrial publicity would make it impossible to get a fair trial, the Associated Press reported. But jurors' preconceived notions about gang members and illegal aliens proved to be a bigger impediment. Guandique is an illegal immigrant from El Salvador who joined the MS-13 street gang. Levy was missing for a year before her body was found in Rock Creek Park.